A Maryland man is among a trio of fraudsters indicted and arrested by federal authorities for perpetrating a $364 million Ponzi scheme, the United States Attorney for the District of Maryland said. Kevin B. Merrill, 53, of Towson, Jay B. Ledford, 54, of Las Vegas, and Cameron R. Jezierski, 28, of Forth Worth, Texas, were charged with multiple counts of conspiracy to commit wire fraud, wire fraud, identity theft, money-laundering conspiracy, and financial transactions over $10,000 in criminally derived property, according to an unsealed indictment. The trio perpetrated their scheme starting in January of 2013. The FBI caught wind of the fraud through a tip, said Gordon B. Johnson, the bureau’s lead investigator on the case out of the Baltimore field office. In roughly a year, the FBI and U.S. Attorney’s office were able to conduct an investigation and secure arrest warrants. All three suspects were arrested in a coordinated, multi-state sting Tuesday, Sept. 18, in the effort to keep records preserved and to seize assets so they may be used to help compensate victims, said Robert K. Hur, the U.S. Attorney for the District of Maryland. According to the indictment, Ledford and Merrill invited investors to buy consumer debt portfolios with them – batches of consumer debts like student loans, car loans, credit debt, etc. that are sold as “portfolios” to third parties for pennies on the dollar, who then try to collect those outstanding debts at a profit. Investors included small business owners, restauranteurs, construction contractors, retirees, doctors, lawyers, accountants, bankers, talent agents, professional athletes, and financial advisors in Maryland, Washington, D.C., Northern Virginia, Las Vegas, Texas, and elsewhere, Hur said in a statement. “Most of the investors are just learning now that they’ve been victimized, and we urge folks who might be victims to contact the FBI,” Hur said. Those who think they may be victims of this scheme can email MerrillLedford@FBI.gov, or go to www.FBI.gov/MerrillLedford . The agency thinks more than 400 people may be victims to the fraud. 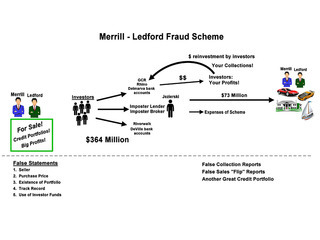 Ledford and Merrill would lie about who they were buying debt from and how much they were paying for it, as well as where investor money was going and the track record of success for those phony investments, according to the indictment. “There were lies being told to prospective investors about almost every conceivable aspect of the scheme,” Hur said. Imposter and shell companies were established, as well as fake portfolios, documents, wire transfers and bank accounts. Names and forged signatures of actual employees of debt sellers were used. 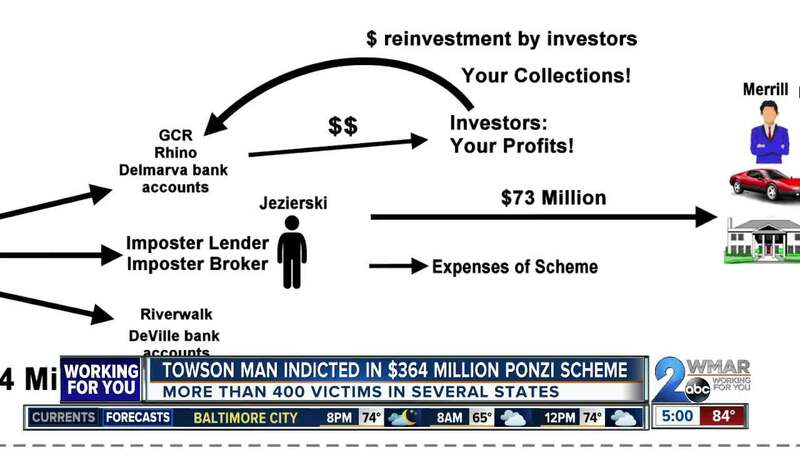 In typical Ponzi scheme mechanics, portions of the money given by investors were disguised as “proceeds,” from the phony debt collection sales and returned to other investors, with Merrill, Ledford and Jezierski personally enriching themselves in the process. The trio diverted more than $73 million in investor funds for their own personal use, according to the indictment. They bought high end real estate in Maryland, Texas, Florida, and Nevada, purchased luxury automobiles, jewelry, a share in a private jet, $25 million in casino gambling, and other elements of an opulent lifestyle. In one such instance, a pool of investors made a $900,000 contribution, of which Ledford sent $483,000 to his personal account, paid prior investors, then sent the pooled investors $83,000 back as “profits,” said Stephanie Avakian, the Co-Director of the Securities and Exchanged Commission’s Division of Enforcement, a third federal agency who participated in the investigation. She described other expensive purchases like Bugatti sports cars and a $375,000 seven-carat diamond ring. The indictment seeks the forfeiture of nine properties, 36 luxury cars, one boat, the interest in the jet, a life insurance policy, seven- and nine-carat diamond rings, and a 23-carat diamond bracelet all allegedly purchased with fraud proceeds. “The anticipation is that these assets will be preserved to be returned to harmed investors,” Avakian said. Often in fraud schemes like this, one of the primary methods of paying back defrauded investors is selling off the ill-gotten gains of those perpetrating the scheme, though I can be difficult to make the harmed parties whole. Merril, Ledford, and Jezierski each face a maximum of 20 years in prison for the wire fraud conspiracy and for each of the five wire fraud counts. Merrill and Ledford could see an additional 20 years for two counts of wire fraud, and another 20 years for money laundering conspiracy and each of four counts of money laundering, and two additional years attached to any other sentence for identity theft. All told, Merrill and Ledford could see sentences of more than 250 years if convicted, Hur said. The trio also face possible fines of $250,000, or twice the gross gain, for wire fraud conspiracy and each count of wire fraud and money laundering. Merrill and Ledford face fines of $500,000 as well, or twice the value of the property for the money laundering conspiracy. Merrill and Ledford were ordered detained after initial appearances in U.S. District Court in Baltimore and Las Vegas, respectively. Jezierski was granted supervised release after his initial court appearance in Las Vegas. Jezierski is expected to make his first Maryland court appearance on Sept. 24, and Ledford is expected to do the same at a later date. Merrill has a detention hearing scheduled for Thursday, Sept. 20 at 3:30 p.m. at the federal court in Baltimore.